Nord Stream: Is the UK link a pipeline too far? In June, Gazprom announced initial plans to extend the Nord Stream gas pipeline; in October, it concluded in a preliminary study that the proposed Nord Stream extension was economically and technically feasible. The project would see the construction of two new lines, one going straight to the United Kingdom with a total annual capacity of 27.5 billion cubic metres (bcm). Gazprom’s CEO Alexei Miller has confirmed the interest of the company’s UK partners in the project, and has hinted that a memorandum of understanding could be signed by January 31, 2013. The cost of the UK extension is estimated to be $16-$20 billion. However, according to BP’s Statistical Review of World Energy, overall gas consumption in the UK has fallen steadily in recent years. In 2011, it was 80bcm, down 15 percent from the previous year, and down sharply from the previous decade’s average of 94bcm. Preliminary data indicates an even larger decline in demand this year as a result of weak economic activity and, more interestingly, an increase of consumption of coal rather than gas. Falling consumption has, of course, led to a rapid drop in domestic gas production. However, the demand for gas imports is rising, reaching around 53bcm gross, 35 bcm net in 2011. And it is likely that EU regulation and UK government policy will restrict the use of coal in power generation, which should increase demand for gas. If liquefied natural gas is bid away to other parts of the world, that too would increase the need for importing pipeline gas. 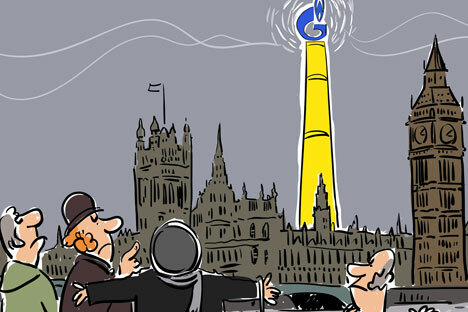 Gazprom sold around 13 bcm of natural gas to UK customers in 2011. Long-term contracts play an important role in Gazprom’s supply to European customers. However, the UK market is predominantly based on spot prices. As a result, Gazprom is not able to enjoy the substantial premiums on its UK sales (as opposed to oil-linked gas contracts) as it does in other markets. The company recently signed a three-year contract with Centrica, parent company of British Gas, to deliver 2.4bcm of natural gas per year. I believe that it is crucial to ensure there is demand for additional volumes of gas delivered via Nord Stream. In March this year, the media speculated that Gazprom was interested in buying a 50pc stake in Dong Energy’s gas-fired Severn Power station near Newport. However, further news about this development has not been forthcoming. Given the potentially weak demand for gas in the UK there is little room for additional supplies of Gazprom gas. The company has earned a reputation for high capital spending associated with ambitious projects, and Nord Stream is no exception. The construction of two additional lines would be highly capital intensive. The high costs of the project would also result in higher transit costs for Gazprom in the future (in the first quarter of 2012, Nord Stream transit costs were more than double that of Ukraine pipelines). The Nord Stream extension is clearly at a very early stage but, if approved, this ambitious project would be a massive commitment for Gazprom over the next few years. I’m not sure that the Nord Stream UK extension would add any shareholder value to Gazprom. Dmitry Loukashov is head of Oil & Gas at VTB Capital.